The AR Sneaker Store: A Perfect Fit for Footwear Retail - Upcoming Media Inc.
Browsing online or in a catalogue for shoes can be great fun, but it’s hard to get an actual “feel” for the sneaker on a flat piece of paper. To really allow consumers to immerse themselves when browsing products, shoe retailers need to embrace technology to provide memorable shopping experiences that will create immediate excitement and gratification, especially when “unboxing” something brand new. That’s why Upcoming Media Inc. has released brand new technology called AR Sneaker Store. Built with augmented reality (AR) technology, your shoppers can “experience” sneakers from the comfort of their homes, work, or anywhere there’s a Wi-Fi connection. Unboxing brand new products is always exciting for customers. In fact, some of the most popular YouTube videos are of people opening up a package and unveiling something totally new to their followers. This is also true with footwear. Whenever a new sneaker is announced, “sneaker heads” around the world make sure to tune in to watch company executives, athletes, or celebrities unbox their new wares. However, with the AR Sneaker Store, customers won’t just have to settle for watching someone else have all the fun. They’ll be able to unbox an actual 3D rendering of the shoe itself, and have the opportunity to share the experience with their social media networks, driving more people to your new product. Launching the AR experience is as easy as tapping on a smartphone. Users will then be able to rotate the sneaker to view it from all angles or tap for more information. Educating the customer with details about the product will help them make a more informed buying choice, and lessen the amount of questions they have when they visit your store to make a purchase. You can also track analytics to better understand customer behaviour, and tailor future marketing efforts around the data. Most of all, you’ll be converting your customers from mere observers to actual participants, encouraging repeat visits and increasing customer loyalty. 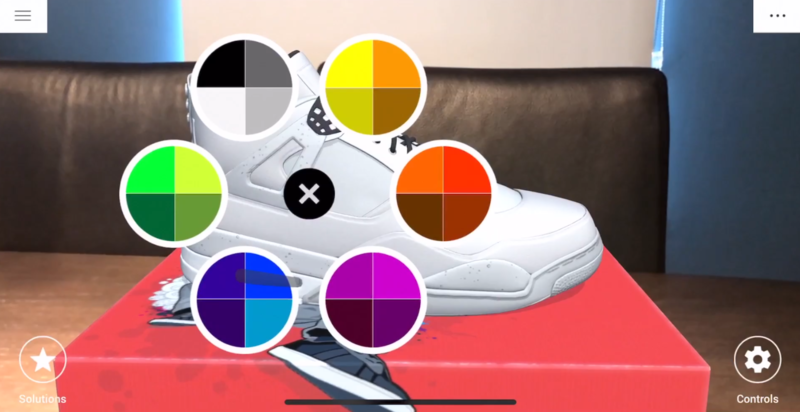 Need a proof of concept that AR technology helps sell sneakers? Look no further than world-class brands such as Adidas and Nike to go “full court press” on bringing technology to their online shopping platforms. Adidas used AR technology to unbox their new Deerupt Sneaker online, the first shoe retailer to do so. Imagine your customers’ anticipation as you countdown to launch day, finally rewarding them with an unboxing experience that closely rivals opening a new pair of sneakers in person. By using a QR code, users were able to immerse themselves in a detailed 3D rendering of the Deerupt Sneaker that enhanced the look and feel of the actual product. The experience is completely shareable to the user’s networks, creating immediate brand advocacy and awareness. Nike has also embraced AR technology by allowing their customers to sample the brand’s AirMax, LunarEpic Low and Cortez sneakers in a wide choice of colours. Launched initially in Nike’s Paris, France location, shoppers had the opportunity to place a white sneaker on a table and browse through the different colour options via a hologram projection. In both cases, customers get a heightened sense of fun when unboxing or shopping for shoes, while learning about the product in an entertaining way that sticks. Investment in AR technology is projected to reach $27 billion by the end of 2018, a 92% increase over 2017. It’s expected to reach $56 billion by 2022, edging its way further into the mainstream. This rapid growth demonstrates AR technology as no longer simply a novelty instrument along the lines of Pokémon GO, but an effective tool for both businesses and consumers through which they learn more about one another, and interact on levels never available before. Just like your favourite sneakers, AR and retail make a great pair.